Portland State at EWU, Thursday, 6:05 p.m.
Sacramento State at EWU, Saturday, 2:05 p.m. The pace was frantic Tuesday afternoon at Reese Court, just the way Shantay Legans wanted it. 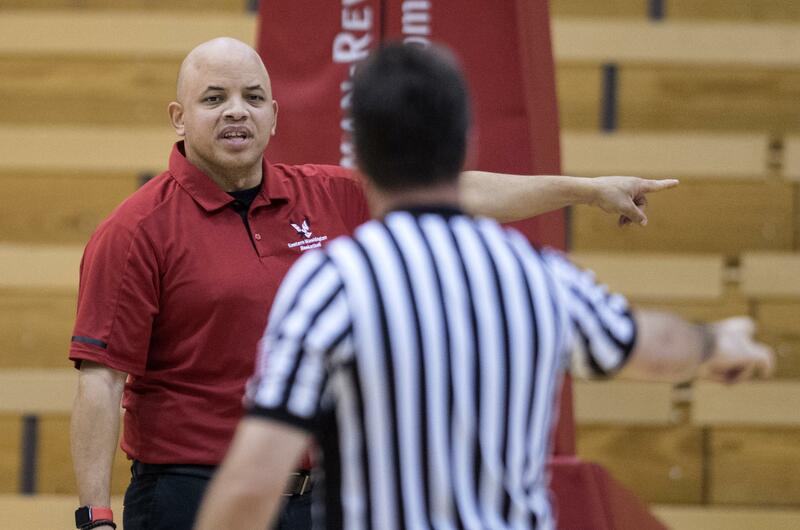 With Portland State coming to town Thursday night, the Eastern Washington coach tried to replicate the Vikings’ full-court press by putting seven defenders on the court. “If we don’t turn the ball over more than 10 times and get back on defense, it will make it harder for them to score against us,” said Legans, whose club leads the Big Sky Conference with only 11.3 turnovers per game. However, PSU leads the nation in steals (12.6) and turnovers forced (19), two major reasons the Vikings (10-4) are one of the biggest surprises on the West Coast, with wins over Stanford, Cal and a trio of West Coast Conference teams. That means, the Eagles will need to slow the pace and take even better care of the ball if they’re to take care of business against the Vikings. “They are a great offensive team, especially when they get the ball out in transition,” Legans said of the Vikings, who are coming off a 70-65 loss at Sacramento State that proves one thing. Anything can happen in what’s turning into an unpredictable year in the Big Sky. Last week, perennial power Weber State lost at Idaho State, while defending champ North Dakota – which took Gonzaga to overtime two weeks ago – dropped two games at home last weekend to Idaho and Eastern. That also marked Legans’ first conference win as the Eagles improved to overall and 1-1 in the Big Sky going into another milestone: Legans’ first conference home stand as a head coach. Sac State visits Reese Court on Saturday. Six days later, the Eagles host Idaho in a doubleheader that also includes the women’s teams. After playing 10 of their first 13 games on the road, “We’re just excited to have our fans back,” said forward Jess Hunt. “Being home for two weeks will be foreign for the guys – they’ll probably be packing their bags thinking we are going to be leaving Wednesday to go back on the road,” Legans said Tuesday. Home-court advantage has been good to the Eagles, who are 49-9 (84 percent) at Reese Court since the 2013-14 season. That won’t be easy against a PSU team that also led top-ranked Duke at halftime of the PK80 Classic in Portland. Moreover, Eastern point guard Luka Vulikic hasn’t played in three weeks as he struggles with plantar fasciitis. His status is “day to day,” Legans said. The loss of the 6-foot-5 Vulikic limits the Eagles’ half-court offense, but guards Jack Perry and Cody Benzel have stepped up. Senior forward Bogdan Bliznyuk continues to carry the Eagles, averaging 18.9 points, 5.9 rebounds and 3.3 assists per game. Bliznyuk is shooting .492 from the field and .846 at the free-throw line. Published: Jan. 2, 2018, 9:15 p.m. Updated: Jan. 2, 2018, 10:45 p.m.